The blackberry is an iconic summer berry and right now they are ripe for the picking. Blackberries, rich with exquisite flavors, are just as good on their own or baked into a pie. Picking blackberries is easy and a great summer activity to enjoy with family and friends. Not to mention, there are endless recipes and ways to enjoy blackberries. These harvesting tips will ensure that you are berry successful in picking the best blackberries. Blackberries start to ripen in July and August, but watch for early bloomers in late June. For the best flavors, it is important to pick ripe blackberries — the ones that are dark black in color and look quite plump. If the berry is a light purple or red or is quite firm, it may need a few more weeks to ripen. Not all berries will ripen at the same time so it is important to check before the birds get to them. The picking part is easy! Most blackberries have thorns so be sure to use caution when reaching deep inside the bush for the perfect blackberry. For the healthiest blackberry bushes, use Espoma’s Holly-tone fertilizer. When you get home, pour the blackberries on to a shallow pan to pick out any moldy or overly ripe blackberries. Blackberries keep in the fridge for about a week, but it is best to use them as soon as possible. The final step is to pick out your favorite recipe and enjoy the sweet taste of summer blackberries. See our top recipe picks below! Mini Blackberry Pies: Do you need desert ideas for your mid-summer party? Here is a recipe for mini blackberry pies. These delicious mini pies will be a party favorite! Blackberry Jam: Try this delectable blackberry jam recipe and your peanut butter and jelly sandwiches will never be the same! Not only will you not have to buy jam this summer, but store some away in a cool dry place and you will have homemade blackberry jam all winter. Blackberry Sorbet: Cool off in the hot summer months with this sweet and savory blackberry sorbet. This recipe is easy to make and easy to store in the freezer for another day. Blackberry Syrup: Blackberry syrup is a tasty substitute for maple syrup! Try the syrup on your favorite breakfast foods and a smile is guaranteed. 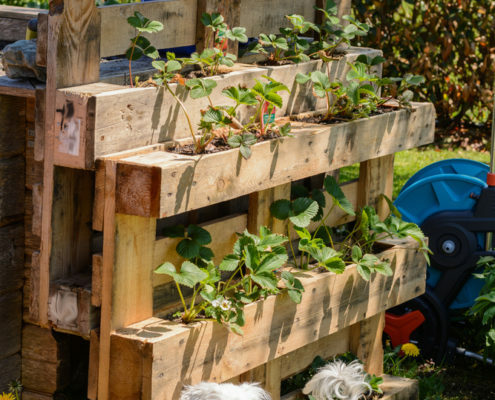 Ready to grow more berries? Learn how Garden Answer grows blueberries in containers! Summer is in full swing and it is HOT! With the heat, comes sitting on the porch enjoying a nice, cold drink. While some enjoy sweet tea and others enjoy lemonade, we love to use freshly grown strawberries for a special treat. 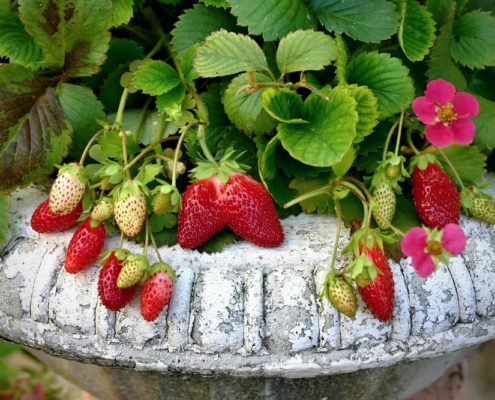 We walked you through planting strawberries in the spring and how to fertilize regularly with Espoma’s Holly-tone to give your plants proper nutrients. Now it’s time pick your juiciest freshest strawberries and enjoy them in a new way. This summer drink is a great alternative to a traditional sweet tea by adding the perfect amount of strawberry sweet to add a hint of flavor. It is genuinely a Yin and Yang moment. Strawberry Shortcake in a glass? This decadent sweet treat will have your friends asking for seconds all summer long! Give your Lemonade a twist this summer by giving it a little sparkle. Sparkling drinks are a great way to cool down by keeping it light! For all the folks that want to Rosé all Day, this take on a traditional rose is delicious. Just try to keep your guests from staring in on a strawberry wine serenade. Everyone loves a pink drink! Take a spin on the classic mojito and add in fresh strawberries. Not only does it change the color, but it will change how you drink mojitos. Summertime classic, made fresh. This sure-fire classic will have everyone asking for the recipe. The flavors really come out with the freshness only a home grown strawberry can provide. The soda craving is real. Replace the syrupy sweet soda with a refreshing fresh strawberry basil soda. You will be surprised on how well the two complement each other. Check out our dinner recipes using homegrown strawberries to impress any guest. Laura from Garden Answer shows how to plant blueberries in containers and fertilize with Espoma’s Holly-tone. Watch the video below to see just how easy it is! Quick! There’s much to be done outdoors and no time to waste! Shed off those winter blues and head outdoors to restore your lawn and garden. The days are getting longer and your soil is beginning to wake up. April is a great time to get out in your yard and begin again. Wondering where to start? We’ve got 6 tasks you can accomplish this month in your own yard. Start tomato seeds. The best way to get a head start on growing tomatoes is to start seeds indoors 4-6 weeks before the last spring frost date in your region. Get planting. Hydrangeas embody everything we love about gardening. They have billowy texture, come in bright colors and are easy to care for. Plant some this month for the best blooms. Choose berries. Did you know blackberries have almost as many antioxidants as blueberries? And raspberries make the perfect addition to jam, cobblers and pies. Berries are just so delicious, scrumptious and oh-so-juicy. Plus, many berries are easy to grow and care for. Find out when, where and how to plant your favorite berries. Revitalize lawns. Perform a soil test to find out what your lawn needs, then amend and choose organic. Organic lawns need less watering, fertilizing and mowing all summer long. Yes — that means you get to spend more time enjoying your beautiful lawn and less time caring for it! Plus, as natural lawn foods break down, your soil becomes stronger on its own and needs less help. Plant blooms. Azaleas and rhododendrons are some of the most popular flowering shrubs. Blooming from late spring to early summer, these shrubs thrive in almost any garden. Plus, they come in virtually every color of the rainbow — from bold pinks, purples and reds to soft, muted yellows and whites. Make sure you’re adding these bloomers to your garden this year. Feed roses. Your roses are waking up now, they’ve made it through a long winter and they are starving! Choose Espoma’s organic Rose-tone. It includes more nutrients than any other rose food. Most rose fertilizers contain three nutrients — nitrogen, phosphorus and potassium (N-P-K). Here’s how to feed with Rose-tone. Sit back and relax once you’re done. April showers will give way to May flowers in no time at all. It’s almost September and your strawberry plants are still yielding fresh, summer-ripened fruit! Strawberries are delicious and versatile. They can be used in desserts, smoothies or anything that’s cooked or pureed. They can also be frozen and made into jams. Where there’s a strawberry, there’s a way! But first, you have to know how to pick. Pick strawberries in the morning, before the sun gets too hot. Immediately after picking, place strawberries in the refrigerator. Be sure to rinse them before consuming, or before preparing a dish. If you decide to not eat your strawberries right away or make them into a recipe, you can still freeze, dry or can them. Blend ingredients together using a food processor until the consistency of the dressing is smooth. Leftovers? Store extras in the refrigerator for up to 4 days. Combine dry ingredients in large mixing bowl. Combine eggs and oil in a separate small mixing bowl. Mix the strawberries into egg mixture. Blend in flour mixture until thoroughly combined. Spoon into greased muffin tins until nearly full. Bake at 425◦ for 5 minutes. After that, reduce heat to 350◦ and bake an additional 15-19 minutes, or until a toothpick inserted in center comes out clean. Place asparagus on a baking sheet and drizzle with olive oil. Roast asparagus for 8-10 minutes, until just tender. Boil. While the asparagus is roasting, boil the balsamic vinegar until reduced to about ¼ cup. Serve and divide asparagus amongst plates and top with sliced berries, basil, and salt and pepper. Use a spoon to drizzle each serving of asparagus with the balsamic syrup and serve! For more great berry recipes and other ideas, check out our Pinterest board and our ultimate berry growing guide! Have a great strawberry recipe you want to share? Drop by our Facebook page! Short on space? 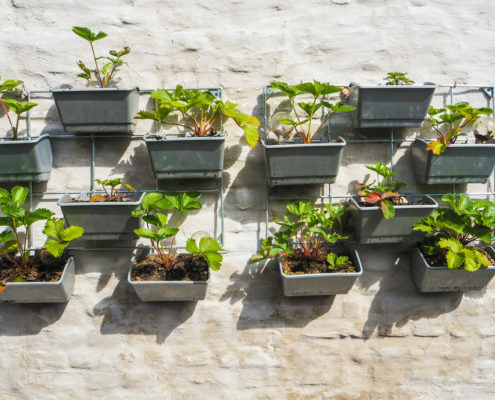 Grow fruits and vegetables in galvanized buckets! Laura from Garden Answer shows you how to plant the perfect companion plants for containers. Try zucchini, peppers, tomatoes and marigolds or raspberries with strawberries.